As I mentioned Facebook is a great place. There are games, applications, emotional codes, animal code. But all those are only if you have some knowledge on Facebook only. 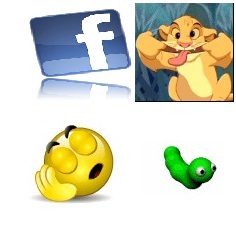 Today I am going to introduce some rare Animal codes for your Facebook chat box. These includes dogs, cats, butterfly, penguin, shark and several other Facebook emotional codes. specificity here is you can send some animated animals too. Facebook dog code is a rare animal chat code you can see. It will not given by Facebook it self. So this will be specially used to attract girls. Because they like animals like dogs and cats a lot. You can copy and paste following code for dog symbol in Facebook chat box. You can copy and paste following code for music animal in Facebook chat box. in Facebook. As this is a animated chat code your friends will like this code a lot. Specially if you want to attract a child this will be the best one. You can copy and paste following code for your chat box for blue butterfly. Usually tigers are not laughing. But here is a nice tiger with laughing at you. You can use this animal code for making your friend just a bit smile. Facebook sweeping rabbit code will indicate your friend that you are bit busy with your works.You can copy and paste following codes to add it to your chat box. Facebook fighting ducks will indicate you that you are angry. You can also use this to say some one about your anger on someones work. Just copy and paste following code below. This is a something funny. Facebook running duck code will helps to make your friens happy a lot. Copy and paste the code below. Faceboo shark code is also important code even though used in world wide. Facebook penguin emotion is also a important and widely used emotional code. Copy and paste following code to add it. I will hope you all will use these emotional codes and enjoy a lot during Facebook chatting. You will be able to see some more Facebook chat codes here.